Dietary Supplement. Advanced Competition Superfood. No sugar added. Aspartame free. Incredible long-term taste satisfaction. Pharmaceutical grade undenatured whey protein isolates & concentrate. Ultra-potent anabolic/anti-catabolic blend of ajuga turkestanica & rhaponticum carthamoides, branched chain amino acids, L-glutamate & taurine. Controlled protein dispersion technology. Full spectrum vitamin & mineral blend. Competition strength nutrition. Designed in accordance with an unprecedented outpouring of request and inquiry from the competitive bodybuilding community, IntraPro gives bodybuilders what they have so long desired. » the first ultra-high quality, competition strength, protein supplement engineered specifically for athletes with a desire to achieve and maintain that big and shredded look. The IntraPro Competition Advantage features all of the highest quality proven nutrition bodybuilders require for substantial muscle growth with a macronutrient profile designed for promoting and maintaining significantly lower levels of body fat. IntraPro draws its significant physique altering capabilities from the complex anabolic/anti-catabolic power of IntraPro AAC7, a unique combination of pure pharmaceutical grade cross flow micro and ultra-filtered whey protein isolates and concentrate dramatically enhanced with an optimal ratio of the branched chain amino acids leucine, isoleucine and valine for inhibiting muscle breakdown, precise amounts of L-glutamine and taurine for maximum muscle cell volumization, and precision dose of the potent micronutrients turkesterone (from Ajuga turkestanica extract) and 20-beta-hydroxyecdysone (from rhaponticum carthamoides extract) for enhanced protein synthesis. If that's not enough, IntraPro contains an effective Controlled Dispersion Complex designed to sustain the release of notoriously fast absorbing whey proteins to help maintain positive nitrogen levels up to twice as long as the typical 2-hour window elicited when ingesting whey proteins. Intelligent bodybuilders on normal 2-1/2 to 3 hour intervals between meals can count on no downtime when feeding precious muscle tissue. When going to every extreme to create the most effective competitor's protein supplement in existence, you have to go to equal extremes when developing the flavor. In medical terms it is referred to as compliance factor, put simply, the better it tastes, the more you will use it. The flavor technology behind this superfood formula ensures that you will look forward to drinking IntraPro every time. The wait is over. 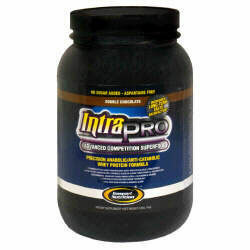 IntraPro by Gaspari Nutrition. » continuing to address the needs of the competitive bodybuilder or serious athlete desiring to achieve peak condition in any season. Gaspari Nutrition delivers again! » Cross flow micro & ultra-filtered whey protein isolates & concentrate. » Vitamin & mineral blend. (These statements have not been evaluated by the Food & Drug Administration). 25%*percent Daily Values are based on a 2,000 calorie diet. Ingredients: Other Ingredients: IntraPro AAC7 (Cross Flow Micro & Ultra-Filtered Whey Protein Concentrate & Isolates, L-Leucine, L-Glutamine, L-Taurine, L-Isoleucine, L-Valine, Ajuga Turkestanica Extract and Rhaponticum Carthamoides Root Extract), Cocoa, IntraPro Controlled Dispersion Complex [Fibersol-2 (Soluble Fiber Glucose Polymer Complex), Xanthan Gum, Cellulose Gum, and Carrageenan], Natural & Artificial Flavors, Silica, and Sucralose. Recommended Use: Depending on your individual protein needs, mix 1 to 3 scoops of IntraPro with 4 to 12 oz of cold water in a shaker or blender, or simply stir into water with a spoon. For maximum results, drink IntraPro 2 to 4 times a day.